Whether you are contemplating a renovation to your personal residence, your business, or hospitality venue – hotel, restaurant, spa – creating a space to match your chic rep will take some serious attention to detail! Art Dallas art consultants will be the right team for the job. Here are some of our favorite tips when creating art packages for new spaces. Antiques can be given new life with a bright, bold fabric. Don't underestimate the influence a gorgeous antique rug can bring to the space. The fine blend of materials, bright and elaborate colors, or specific traditional patterns found in antique rugs are grounding in a modern design. From records of your favorite artists to rugs, shadow boxes present a wonderful array of memorabilia for daily viewing. If you are not sure how to best display your items in a shadow box, don't worry! Bring in the items you would like to display and we will suggest an attractive shadow box design that will become a treasured family heirloom! Shadow box frames allow us to display almost any object. Don't Underestimate the power of a good Frame. Don't underestimate the power of a good trim. Whether on the image, matting, or framed artwork, a border will instantly clean up any look. Custom picture framing and art selection should be an exciting experience. Our ongoing mission is to stay on top of the latest trends in color and design so that we can give you the best advice possible. Finished Corner Frames, also known as Closed Corner Frames, are the ultimate in framing quality and craftsmanship. Hardwood frames are finely sanded on the corners to create an invisible seam while gilded finished corner frames are finished with a layer of gesso. They are then surfaced with gold leafing for a seamless design. Creating a collection will make your business feel more cohesive and artwork always makes amazing conversation for patrons and employees alike. Investing in an original can be pricey but it is a long-term investment. Filling your new place with junk store artwork may be cost-effective, but it will not be worth anything in the future. Most cheap artwork is also not made with the best material ... don't substitute quality for quantity. Art Dallas is mindful to present art and artists that are budget-appropriate. The artwork is separated into categories such as lobby, corridors, waiting areas, break rooms, etc. We continue to communicate and incorporate feedback. Once we have a good feel for what the client loves, we can fine-tune the selected work. Double the amount of sunlight in your room by allowing it to bounce off reflective surfaces. Hang a large mirror directly across from the largest window in your room, or arrange an array of smaller mirrors to help brighten up the space. Thanks to its captivating look, antique mirror shows how far updating the classics can take you. These natural elements add major glamour to any room. The cultured and regal aesthetic of the vibrant precious metal that is layered on the Art Dallas antique mirror has proven to be timeless and enduring in its appeal; these works are a lovely addition to a neutral environment, and appear luminous in the soft glow of diffused, natural light. Whether your space is a personal residence, your business, or hospitality venue (hotel, restaurant, or spa), Art Dallas recognizes that each of those areas requires a unique understanding to meet an individual organization's art needs. Our experienced staff collaborates with your interior designers, facilities managers, and other key personnel to ensure that each project is executed on time and within budget while clearly expressing your corporate vision. Listening to the needs of the client and integrating these values through artwork is our first step to creating beautiful art packages. 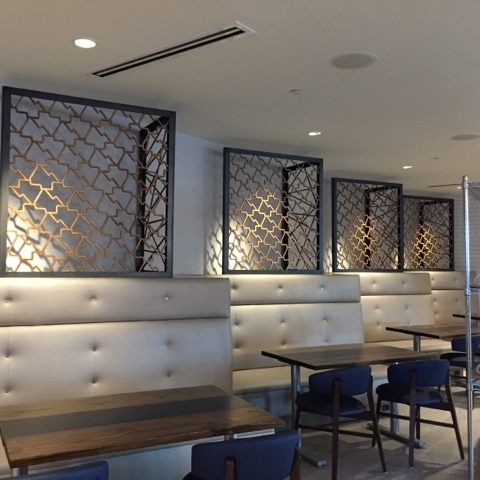 Art Dallas' professional art consulting team members work to get the right feel for a project’s final message and what it says about corporate, hospitality, healthcare, or residential space. Art Dallas believes that the pathway to excellence in art consulting is through carefully listening to the client and integrating their wishes and values into the design process so that the complete art package reflects the client’s perspective and personality. Interior design is like a three-dimensional game of chess: you have to think about space both vertically and horizontally. In some cases, the space feels too small or large enough that you have enough space to swing dance in the living room. You must break down these rooms and create spaces with scale. An expansive room needs different sized artwork. Creating separate spaces with large art panels is always a beautiful option. Look for teams like DFW Art Installation with skills that are the perfect resource for art consultants, interior designers, businesses and homeowners. You want a team to have experience and expertise in transporting, arranging and installing home, gallery, and office collections. No matter the placement of your art, the team should work with you and your surroundings to give your art the look and security that was intended. Tools are important as well. Your team should have a wide range of secure hooks, anchors, and brackets to use for installations that fit any location and style of art. Whether it is one piece or one thousand pieces, DFW Art Installation can assist with your home or business project.